MOUNT HOLLY, N.J. - The name of Jenn Tompkins' company sends customers into fits of laughter. "When I answer the phone and I say, 'Rent The Chicken, this is Jenn,' they giggle and say, 'I would like to rent the chicken.' And then they giggle some more," Tompkins said. But poultry leasing has turned out to be a serious investment as more people want fresh eggs from humanely raised hens, without the responsibilities of ownership. In two years, Pennsylvania-based Rent The Chicken has expanded to three other states, plus Toronto. The growth is not an aberration. Coop rentals are booming nationwide as residents in cities, suburbs and the countryside flock to the anti-factory, locally sourced food movement. Some families also rent fowl as an educational experience for their children. "As a society, we don't really like commitment," Tompkins said while visiting an affiliate in Mount Holly, New Jersey. "We don't want a contract on our cellphones; we don't want long-term commitment with our cable company. With chickens, they can live to seven or 10 years, and people are a bit scared of that." Rentals remove that risk. Prices depend on the company, location and lease duration but start around $150 month. Most basic packages include two hens, a coop, feed and phone availability to answer questions. Birds can be returned early if things don't work out -- and are available for adoption if things go well. Rent a Coop, based in the Washington suburb of Potomac, Maryland, started out renting five or six coops per month in 2012, according to co-owner Tyler Phillips. Now they're renting 25 to 30 monthly and are opening a second location in New Jersey. "I think it will be sustained," Phillips said of the business model. "People want to know where their food comes from." Further evidence comes from the growth of BackyardChickens.com, an online forum that started eight years ago with 50 members and now has more than 325,000, according to administrator Rob Ludlow. The site gets about 7,000 daily posts from chicken enthusiasts, Ludlow said. Jenn and Phillip Tompkins incubated their company in 2013 at their homestead on the outskirts of Pittsburgh. Jenn Tompkins' home-based job as a university research assistant was ending, and she began looking for another way to work from her house. They had recently moved to western Pennsylvania from a rowhouse near Baltimore in search of a simpler lifestyle, with a garden and small flock of chickens. "It's a slippery slope," Tompkins said with a laugh. "We had the garden, we got some chickens; we had a bigger garden, got some more chickens. And now we have a chicken rental business." The rental coops have wire bottoms and wheels so customers can move them to different spots in their yards, giving the hens fresh grass and bugs to eat in addition to their feed. Two chickens collectively produce about a dozen eggs each week. Companies suggest would-be renters speak to neighbors first and do some research to ensure they don't run afoul of local ordinances or homeowners associations. But regulations can be nebulous, especially when the birds are temporary, and are usually enforced only after complaints. Unlike crowing roosters, hens are generally quiet, clucking softly and briefly after laying an egg, Phillips said. 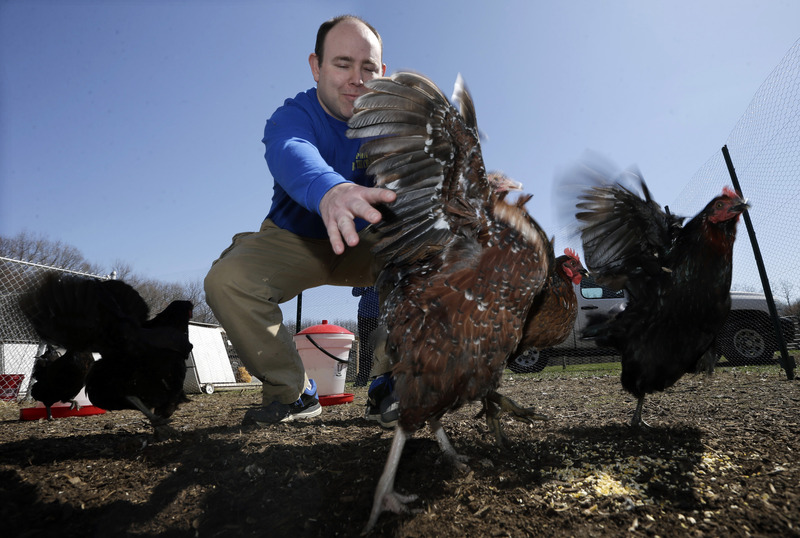 He has picked up coops from urban sections of Washington where residents didn't realize their neighbors had chickens until they saw the birds leaving. Leslie Thyberg has rented from the Tompkinses for about a year in the East Liberty neighborhood of Pittsburgh, where the concept's popularity has led city officials to try to streamline permits for backyard livestock. The healthful, tasty eggs and quiet good nature of the birds has won over skeptics like her husband, Thyberg said. She enjoys relaxing with a cup of tea or glass of wine while watching the hens hunt and peck in the backyard. "They have personalities," Thyberg said. "I didn't really think about chickens having personalities."